The number two on our horses to watch might just be the best horse in the world running at this time, according to Rogers. The four-year-old filly won the Arc de Triumph, beating out males in the most prestigious race in Europe. “She was only the eighth horse to win it in back-to-back years. That’s quite an accomplishment. I look for her to spring forward and tackle males again in the Breeders’ Cup turf and she’ll be very tough to beat,” said Rogers. LOUISVILLE, Ky. (Monday, Oct. 22, 2018) – On a blustery Monday morning beneath the historic Twin Spires, Breeders’ Cup Classic (Grade I) hopeful Yoshida (JPN) worked five furlongs in 1:00.80 in preparation for the 1 ¼-mile race on Nov. 3 at Churchill Downs. Yoshida, the two-length winner of the Woodward Stakes (GI) on Sept. 1 at Saratoga, began his work at the five-furlong pole in company with 2017 Kentucky Downs maiden special weight winner Morocco through eighth-mile splits of :13.20, :25.60, :37 and :49 prior to galloping out six furlongs in 1:14 and seven furlongs in 1:28, according to Churchill Downs’ clocker John Nichols. Morocco completed his breeze after a half-mile in :50. Yoshida has won five starts in his 11-race career with purse earnings of $1,289,770 for owners WinStar Farm, China HorseClub International, SF Racing and Head of Plains Partners. Mott has won the Breeders’ Cup Classic twice before with Cigar (1995) and WinStar Farm’s Drosselmeyer (2011). In the barn adjacent to Mott on the Churchill Downs backstretch is fellow Breeders’ Cup Classic contender Mind Your Biscuits, who was pre-entered to run in the Classic as his first option but could also pre-enter in either the Dirt Mile or the Sprint as a second option, according to trainer Chad Summers. 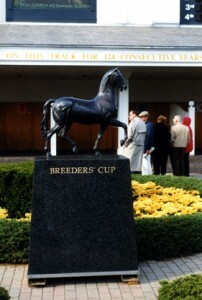 Pre-entries for all 14 Breeders’ Cup races were due at noon (all times Eastern) Monday. The pre-entry announcement will take place on Wednesday at 11:30 a.m.
Official Mobile App and Facebook page. Other Breeders’ Cup hopefuls on the Churchill Downs work tab Monday included Longines Distaff (GI) contender Midnight Bisou, who worked five furlongs in 1:00 outside of two-time winning 3-year-old colt Principe Guilherme, and Sprint candidate Switzerland, who breezed five furlongs in 1:00.60. Hall of Fame jockey Javier Castellano did not have much time to celebrate his 5,000th-career win on Saturday at Belmont Park before catching a plane to Louisville to work Robert LaPenta, Madaket Stables, Siena Farm and Twin Creeks Racing Stables’ Breeders’ Cup Classic (GI) contender Catholic Boy five furlongs in 1:02.60 at 5:30 a.m. (all times Eastern) Sunday at Churchill Downs. Castellano and Catholic Boy broke from Thomas’ stable pony at the six-furlong pole and started the five-furlong move through splits of :13.40, :26, :38.20 and :50.60 prior to galloping out six furlongs in 1:15.40 and seven furlongs in 1:28, according to Churchill Downs’ clocker John Nichols. Nearly four hours later, Hall of Fame trainer Bill Mott’s Breeders’ Cup Turf (GI) contender Channel Maker worked a half-mile in :49.20 inside of stablemate Prompt through opening fractions of :12.60 and :24.80. He galloped out five furlongs in 1:03. Also on the Saturday work tab was South Florida-based owner/trainer Juan Carlos Avila’s Champagne Stakes (GI) fifth-place finisher Trophy Chaser, who breezed five furlongs in 1:01.40 with Castellano aboard in preparation for the Nov. 2 Breeders’ Cup Juvenile (GI). One of Trophy Chaser’s likely competitors for the Juvenile is Hall of Fame trainer Steve Asmussen’s Iroquois (GIII) runner-up Tight Ten, who blitzed five furlongs in :59.60 in company with stablemate Wilmington (five furlongs, 1:00.20). Rounding out the Sunday work tab was 2014 Breeders’ Cup Classic runner-up Toast of New York, who breezed an easy half-mile in :53.60 for trainer Jamie Osborne. 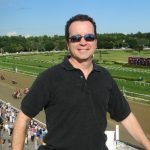 The now 7-year-old gelding, who was the second-place finisher behind Mind Your Biscuits in the Sept. 29 Lukas Classic (GIII) at Churchill Downs, could target the Breeders’ Cup Classic or the 1 ¾-mile Marathon Stakes (GII) on Friday, Nov. 2, according to Osborne’s assistant Jimmy McCarthy.